All My Happy Endings: blogger event sign up! Kerry from Ohsoamelia is currently looking for bloggers to participate in another cash giveaway! After many previous group giveaways which have been such a success such as the $500 cash giveaway which had over 80,000 entries she has decided to host another amazing giveaway for you lovely lot! The giveaway will go live at the end of May (date to be confirmed). You don't want to miss out on this one! 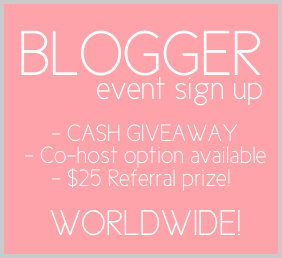 Referral prize of $25 for the most referred blogger: Re-post this event and get other bloggers to mention you when signing up. Found you via the Linkin w/ my ladies hop! I'm signing up for this. Awesome giveaway opportunity! New follower here. Thank you so much for hosting the linky! Hi angel! You're so sweet for commenting -- I appreciate you so! "Crazy 9?" How intriguing! I can't wait to visit you -- I will do so shortly. Hugs! Hi! My name is Busola Coutts and i am your newest follower on bloglovin from the hop!